A suspect who used the identity belonging to others committed several high-end mountain bike thefts from bicycle shops in Thousand Oaks and throughout Southern California has been arrested in Los Angeles County. On 10-24-18, patrol deputies from the Thousand Oaks Police Department responded to Newbury Park Bike Shop in Thousand Oaks reference a high end mountain bike theft. During the preliminary investigation, the reporting deputy learned the suspect had identified himself by using a fraudulent California Driver’s License. The suspect requested to test ride a Santa Cruz Bronson mountain bike retailed at over $5000 and provided the fake driver’s license, a wallet containing a credit card, social security card and a set of keys as collateral. The suspect rode off with the bike and did not return. During a follow-up investigation, Financial Crimes Detectives from the Thousand Oaks Investigations Bureau learned the true identity of the suspect as Anthony Negreary. Detectives learned Negreary was involved in at least 11 other similar high-end bike thefts from bicycle shops throughout Southern California. Financial Crimes Detectives with the Thousand Oaks Police Investigations Bureau coordinated with detectives from Santa Monica Police Department, Los Angeles Police Department, Buena Park Police Department, Pasadena Police Department, and Arcadia Police Department, who all had open cases with similar high-end bicycle thefts. It was determined Negreary was the suspect in all the cases and used similar methods by using the personal identifying information of others to commit the bike thefts. During the investigation, it was determined Negreary had used the personal identifying information of several victims to rent an apartment in Los Angeles County, purchase a car, finance a loan, open bank accounts, credit cards, and obtain fraudulently manufactured driver’s licenses and social security cards. On Friday, November 2, Negreary was arrested by the Los Angeles Police Department Warrant Detail for a warrant for one of the bike theft cases in their jurisdiction. Negreary bailed out of jail on the warrant the same day. Thousand Oaks Financial Crimes Detectives obtained an arrest warrant for Negreary for identity theft and grand theft. 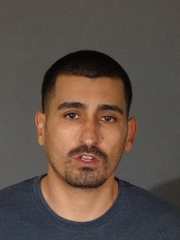 Detectives coordinated with LAPD detectives and on Thursday, November 29, 2018, Negreary was again arrested by detectives from the Los Angeles Police Department for the Thousand Oaks warrant. Negreary was booked into custody at the Los Angeles County Jail where he awaits court proceedings for consolidated cases for grand theft and identity theft. Once Negreary’s case in Los Angeles is adjudicated he will be transferred to Ventura County to face charges. Anyone with information about similar high-end bike thefts or has additional information about the suspect, is asked to call Detective Paul Ferruzza at 805-494-8231.